The issue of who is a tribal resident of Jharkhand and who is not has come to haunt the first non-tribal chief minister of the state. This is the first time since the formation of the state in 2000 that a national party, Bharatiya Janata Party (BJP), is in power. And right since the time of its formation, there has been a demand for a domicile policy. The last time there was an attempt to define domiciles was in 2002. But the Jharkhand Vikas Morchaled coalition, under the then chief minister Babulal Marandi, had to withdraw the policy following violent confrontations between the tribal and non-tribal populations. The present government, on April 6, passed an order that said all people living in the state before 1985 are domiciles. But the order has ruffled more feathers than it has soothed. Regional parties have expressed their opposition to the policy and organised state-wide protests in the past two months. Considering that BJP gets most of its votes from the urban centres of the state and from non-tribal populations, the electoral calculations of easing up the process of obtaining the domicile of the state is evident. But the state government seems to have miscalculated the significance of the domicile issue in rural Jharkhand, where the majority of the population lives. Domiciles of any state are entitled to certain privileges that are denied to other residents. For instance, reservation in government jobs. In Jharkhand, all grade 3 and grade 4 jobs are reserved for domiciles. The fear is that as per the new definition (see “Who is a Jharkhandi’) these jobs, which should go to the tribal (adivasi) and non-tribal natives (moolvasi), would be taken up by people who have moved to the state in recent times. “The rights of indigenous people across the state are being snatched away with this policy. So far, all definitions of domicile were based on either the 1932 land registry (khatiyan) or the 1964 Bihar land survey. But this new 1985 cut-off seems arbitrary,” says T N Sahu, who heads Sadaan Manch, a moolvasi coalition. Protesters say the policy is an attempt to gain votes. “It seems suspicious that our chief minister, a non-tribal from Chhattisgarh who moved to Jharkhand in the 1970s, has set a qualification of 30 years of residence to claim domicile. How will this policy help the natives who fought for the creation of the state and have the first right over its natural resources?” asks Arjun Samadh, a Jamshedpur-based activist belonging to Ho tribe. It was a similar discontent that led to the formation of the state, say experts. Jharkhand holds a significant part of India’s mineral wealth and has always had tribal and non-tribal indigenous people in the majority. Though the number of adivasis has fallen—from two-thirds of the population in the 1950s to one-fourth, as per Census 2011—the combined population of tribal and non-tribal natives is still around 70 per cent of Jharkhand’s 31.9 million residents. “The situation is such that government offices at all levels are filled with officials who are not from Jharkhand. At least the tribal population has the protection of reservation, but the moolvasis have no such safeguards and stand to lose the most from the influx of non-Jharkhandis,” says Sahu. Jobs are not the only reason people are protesting. 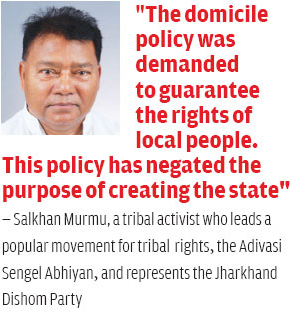 What the policy entails is actually an attack on the identity of Jharkhand, says Salkhan Murmu, a tribal activist who leads a popular movement for adivasi rights, the Adivasi Sengel Abhiyan, and represents the Jharkhand Disom Party. “There are multiple languages native to this land. Yet our official language is Hindi. It a vicious cycle perpetuated by policies such as the current domicile policy,” explains K C Tudu, who heads the department of tribal and regional languages at the Ranchi University. What the protesters want is not a withdrawal of the policy but an amendment. The demands are basically twofold. One, a change in the cut-off year from 1985 to 1965 to ensure that the required residence for domicile is 50 years. Two, distribution of jobs at the block level instead of the district level, with 90 per cent of the posts being filled with recruits from villages. For the first 14 years of its formation, Jharkhand had tribal chief ministers from regional parties. People expected them to be sympathetic to the local demands. But no domicile policy was formulated. “The situation we find ourselves in is because of years of failure on the part of regional leaders. They enjoyed power and could have formed a domicile policy beneficial to the natives,” says Samar Bosu Mullick, a Ranchi-based activist. Regional parties, however, refute the allegation. “Despite the short time we had, we created a draft which would have kept the native interests at the forefront. 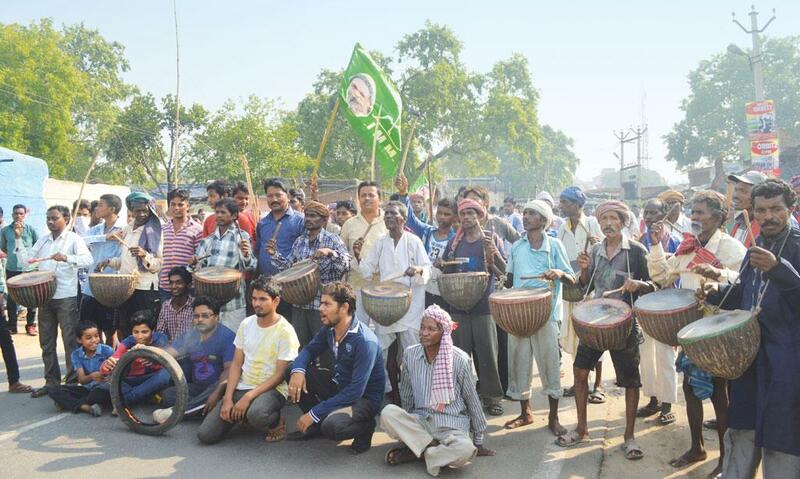 But unfortunately we did not have the time to implement it,” says Jharkhand Mukti Morcha chief secretary Binod Kumar Panday, referring to the 14-month stint of party chief Hemant Soren as chief minister before the 2014 elections. Though there have been reports of discontent among state BJP members on the implications of the policy, the government has not reacted. “Of course, there is some dissatisfaction but the policy was made in consultation with several stakeholders. If a solid case for change is made, the policy could be amended. 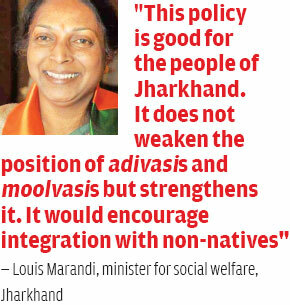 But as far as the party is concerned, it is good for the people of Jharkhand,” concludes state social welfare minister Louis Marandi. The story was published in the July 16-31, 2016 issue of Down To Earth magazine.